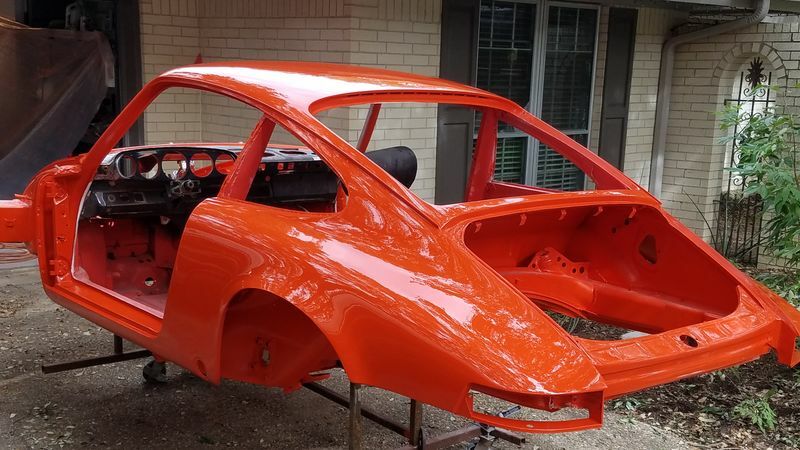 I am currently working towards painting my 72. Its been almost 15 years since I last painted the car. There are a few areas that need minor attention. What is the current best practice in regards to a skim coat of filler? Either way is fine, it's one of those personal preference things. personally with most jobs i will do bare metal, one thin coat of epoxy , body filler , then another thin coat of epoxy just on the bare metal from sanding , then my filler primer , guide coat block if needed i will filler prime again guide coat then block again for sealer and top coating. I disassembled my car short of removing the glass, prepping it for paint. Pulling off the tops of the doors and things that poke through the deck lids revealed minor rust around those holes, like chips down to the metal. 'Got some rust converter, primer and some kind of filler to address those areas. Am I on the right track? Sand first? Convert and then fill, prime and block? In taking the car apart I also noticed, due to it's body work (had fenders switched out) it is a Frankenstein car, made with red and blue pieces (original was metallic brown changed to white). I feel like stripping the color/texture off the backsides of these pieces (bumper and "running boards") and retexturing/priming/painting grey or black before turning over the car to my painter. Is ok? Thanks. I went with single layer of epoxy. I am now working on a skim coat of filler in a few spots to level the surface. I metal worked as best I could. The filler is really thin and I am OK with that. I will then move on to another full coat once a few panels get some attention. Then a high build primer sealer that is final blocked for paint. Getting excited about this moving forward. Old thread, but I thought I could add some near-scientific info I found elsewhere. It would appear that the filler binds better to the metal than the epoxy. Therefore, less risk of delamination when you apply filler, then epoxy. This is what I did, and used a phospate solution to prevent flash rust. as i have stated countless times 1st not all fillers like to go over primed or painted substrates just as there are fillers that do not like to be applied over bare metals. there is also the fact that not all epoxy primers are the same and this also goes for epoxy sealers. not knowing PPG products i can not comment on what they did or how they did it. how ever the 1st thing that comes to mind is the fact they didn't wait for the epoxy to cure only dry still in a window of recoating. most all recoating windows are for applying a filler primer over the epoxy not spreading body fillers. if a product has not gone to it's cure state yet then solvents are still evaporating and you will not get a good bond with a filler if this is the case. this is why on most cans of body fillers they say you can use it over cured paints. 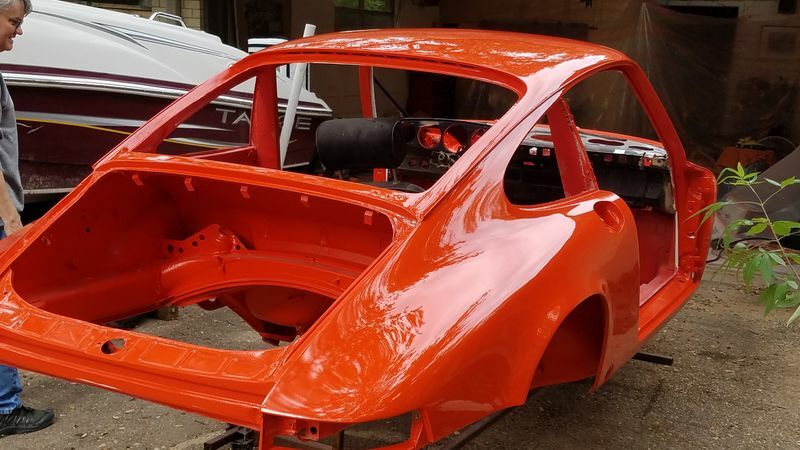 The car is now painted. You can follow along in my build thread. The process I followed. Please note that I did not include cure times or other specific details about the products I was using. I used a single product line through color and then a compatible color coat. Make sure you follow the Technical Data Sheet (TDS) for each product. Mixing times, pot set times, pot life, surface temperature, product temperatures. gun setup (tip size, pressure) - it all makes a difference. block sand entire surface - mostly long sanding board here. 80 and 120Grit depending on surface contour and amount of filler needed. Here is the final result. I am very pleased. This is right out of the gun. I Have not yet cut and buffed the surface. I am letting the paint cure a week before starting to sand again. My arms need recovery. the boat in the pic your? you take it up to lake travis?? i go to Austin once a year or so we like to go to Oasis for dinner after the races at COTA. Could not have done it without the fantastic advice here. I have painted a few other cars but this one is by far the best. Yes, That is my boat. We have a small place on Lake LBJ. This is 2 lakes up from Lake Travis. It was damaged in the flood last month and I brought it home for some repairs. 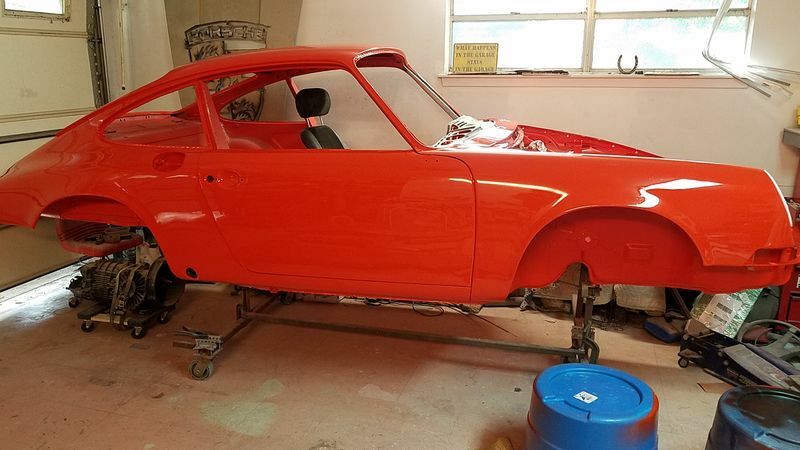 That is next on the list now that the car is painted. The Oasis has an amazing view. Best on Lake Travis for sure. Garage spray? Looking killer! I'm leaning towards this myself as the quotes are so high here, that it's almost not worth it for a competition car.